Begum Rokeya University Admission Notice 2016 17 has been published on website. The university website www.brur.ac.bd. Begum Rokeya University Admission test exam published from 13 November 2016. Here you will get Begum Rokeya University Admission test exam Notice 2016-17, Minimum GPA requires, University Faculties and units, admit card. Begum Rokeya University Admission test exam will be de started from 13 November 2016. The University year test exam has been started from 13 November 2016 to 17 November 2016. A unit Admission test exam 2016-17 date 13 November 2016. The university B unit Admission test exam 2016-17 date 13 Novenber 2016. C unit Admission test exam 2016-17 will be held 14 November 2016. Begum Rokeya University D unit Admission test exam 2016-17 will be started 15 November 2016. E unit Admission test exam 2016-17 date 16 November 2016. The University F unit Admission test exam 2016-17 will be started 17 November 2016. Begum Rokeya University online Admission started date 1st October 2016. This University online Admission will be ended date 20 October 2016. Begum Rokeya University Admission 2016-17 you need minimum GPA for Admission this University. And you must be passed in SSC 2013-14 and HSC 2015-16. If which students passed before 2013-14 in SSC exam. Then you cannot Admission this University. Which Students passed before 2015-16 in HSC exam. You cannot apply this admission test exam. For Admission humanities units you will get GPA 6.00 in both SSC and HSC exam. The University Admission for Business departments you have must get total GPA 6.oo in secondary and higher secondary exam. Any candidate Admission Diploma in Commerce and Business Management department. The candidate get GPA 6.50 in SSC and HSC exam. Which candidate get under GPA 6.50. Then the candidate cannot Admission this department. You must have needed GPA 6.50. If any admittance Admission Agricultural and home Economics units. Then you must have get GPA 7.00. Any candidate cannot get GPA 7.00. 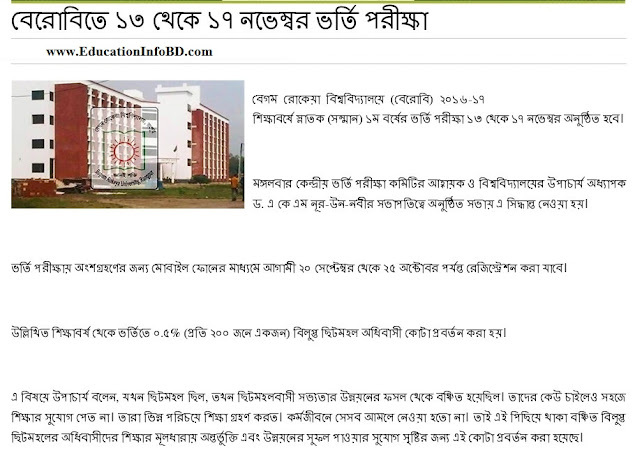 You cannot Admission of Begum Rokeya University Agricultural and home Economics Units. Begum Rokeya University has six Faculties and six Units. Here you can want to know all Faculties and all proportionate units about Begum Rokeya University. The University Ka unit has Faculty of Arts department. Begum Rokeya University Kha units are Faculty of Business Studies department. This University Ga unit has Faculty of Engineering Technology and department. The University Gha unit Faculty of Life and Earth Science department. These University Uma units has Faculty of Social Science department. At least the University Cha units Faculty of Science department. Begum Rokeya University Admission exam 2016-17 admit card will be seen from 30 October 2016. Admission for Begum Rokeya University, you do the download admit card. This admit card has exam time and all exam details information. For download admit card, you need A color picture and signature. The admit card picture size will be 300300 pxl. The admit card signature size should be 30080 Pxl. If you want to get more details about admit card . Then you will find the website www.brur.teletalk.com.bd. BRUR<space>HSC Board Name<space>HSC Roll Number<space>HSC Passed Year<space>SSC Board Name<space>SSC Roll Number<space>SSC Passed year<space> Your Unit<space>Quota and then send to 16222.